As the 2016 Rio de Janeiro Olympic Games approach, do you ever wonder how so many incredible athletes get to such levels of peak performance? What does it take to get all the way to the Olympics? 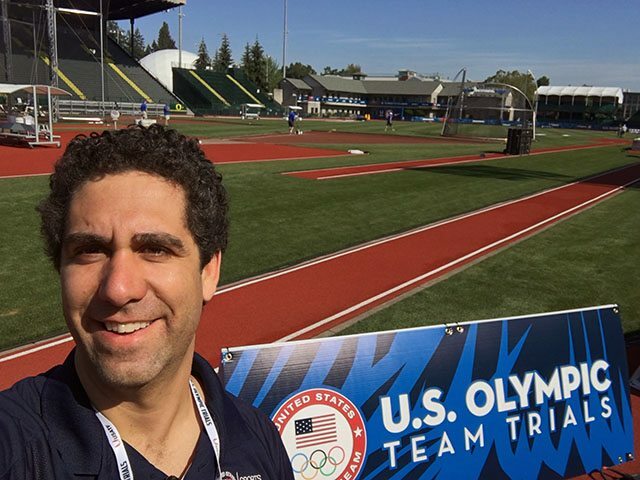 I got the chance to talk with Dr. Andrew Cohen of Proactive Chiropractic, a volunteer on the sports medicine team at this year’s U.S. Olympic Track and Field Trials in Eugene, Oregon. Read on for an insider’s take on what we should watch out for these Olympics, the importance of mental preparation, and what makes champions rise above the rest of the competition to become part of Team U.S.A.
BQ: What is your role at these Olympic Trails? AC: I’m part of the sports medical team doing chiropractic work on the athletes. I’m in a giant tent with maybe 20 other healthcare providers at a time. We stay pretty busy. People are from all over the map; from MDs who are here to make sure no one has a heart attack — though we’re dealing with some of the healthiest of healthy in the population, so the odds are really low, but they still need to be here — to athletic trainers, chiropractors, physical therapists, massage therapists and acupuncturists. BQ: That’s quite a mix. Can you tell us more about what it’s like inside the tent? AC: It’s an amazing interdisciplinary group of people all working for the same goals. It’s interesting what happens when you take money out of the picture — it’s a big deal to be selected to volunteer at this event — so the people who are here are into sharing and collaborating, trying to get others’ best practices. We’re all learning together. Working on the athletes is epic and inspiring as a healthcare provider. But it’s also really inspirational to work with other doctors who have worked other Olympic Games or Trials and have them teach you how they approach things. It’s like a mind meld of best practices. BQ: Can you tell me anything about the athletes you’ve worked with? AC: I can’t name drop, but my first patient was a 2008 gold medalist. And I didn’t even recognize them at first! People look really different on TV than they do in real life. I’ll just say that. BQ: What’s different about working with such elite-level athletes versus your regular patients? AC: I’ve worked events like this before, but never at this level. In my normal day-to-day practice, maybe 20% of people have no real complaint but feel little off, so they come in. But with this population something like 90% of those coming in have recently been checked out, but are like, “Hey, I’m competing. I just want to make sure everything’s working as perfectly as it can.” So most people don’t have a chief complaint, which is great because it’s the best of the best in the United States and we’re there to make sure they stay healthy. BQ: We hear a lot about how athletes use their minds to pursue excellence, maybe even more than their bodies. Have you seen this in the athletes you’ve worked with? Does thinking really make that much of a difference in what you can do? AC: I have had a few people on the table like that. A long jumper told me that as the competition gets more intense, she feels the stress more. She came in with a headache. At first she said she’d had injury a few weeks before, then these headaches. She’d worked through it, but the headaches were back. So I said, “Well, I don’t think you’re going to do it tomorrow. I don’t know you well, but it seems to me like you’re kind of hard on yourself. You’re setting expectations that aren’t necessarily realistic. Even if you broke your personal record you’d still find something else that wasn’t perfect. So let’s not focus on perfection but on your best run for you at that time.” We talked about that and by the time our visit ended, her headache was gone. That was not what she expected when she got on table. BQ: Tony Robbins says that trying to be perfect is insane, and this is a great example of that principle in action. Did you come across any rituals or habits that people used to keep themselves focused before and during competition? AC: There was a sprinter who said, “I don’t notice anything when I’m running. I’m not in my body, I’m just running. … I don’t really feel my body.” So I’ve asked a lot of people what they do before they compete. A lot of the athletes have a set routine they use to get into a state of focus. It seems like not thinking too much when actually running or throwing or whatever is pretty common. Michael Phelps [the swimmer] has a one–hour routine before he races where he listens to the same songs, does the same stretches, it’s always the same routine. It’s all really intentional, especially at this level. BQ: Switching gears, what should us armchair athletes look out for this year? Any crazy innovations changing the face of today’s sports? BQ: What will you be watching during the 2016 Olympics? 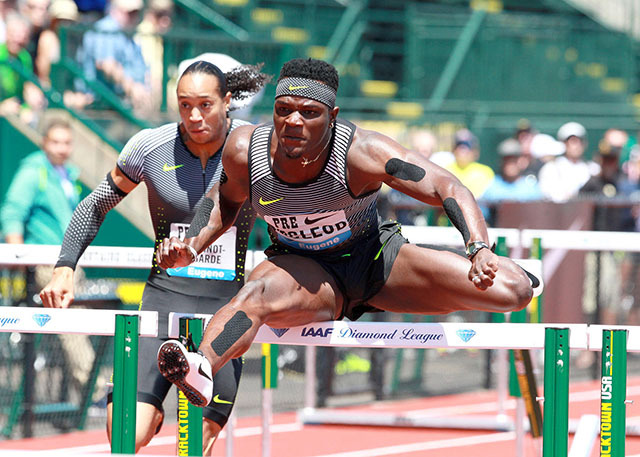 AC: Definitely the 400m hurdles. I’m super excited to see all the track and field events. After working with this population for a little while and seeing the level of commitment, how gentle and kind they are with each other and to everyone around them, I just love it. No one acts like a superstar, even the superstars of this sport. I had opportunity to chat with multiple former gold medalists, and it wasn’t until they left that I realized exactly who they were. They were so generous with their time and attention. BQ: Any other takeaways from this experience? AC: I think it’s incredible how exceptional these athletes are and how they don’t go into a dark place even after they lose. Probably 90% of people didn’t qualify to go to Rio, but they still hang out and cheer for other people they know. You couldn’t tell when treating them if they’d qualified or not. I’ve never seen that at other events I’ve worked at, like professional BMX or basketball. It’s never been where you couldn’t tell who won or who lost. I’d ask, and they’d say “No, it wasn’t my year.” I wish that I had that poise and wherewithal. I’m not sure if they’ve programmed themselves to wait until alone time to process or if their coaches have done such good job preparing them for any result. In any case, it’s been really inspiring.